Nearly four years ago, Big Lottery Fund invested £2.1m in the development of the KnowHow NonProfit site, created by a small team working out of the Cass Centre for Charity Effectiveness. But how to maintain and develop what was a mainly free resource when funding ends? Here Luke Chaput de Saintonge, formerly Head of Content at KnowHow NonProfit, now Content Strategy Manager, NCVO, gives an honest assessment of the challenge, and the part that the site might play in future developments. During its short but fruitful existence knowhownonprofit.org has flirted with greatness but also strayed close to the digital scrap heap. So where is it today? Will it go the same way as so many other voluntary sector support sites – into some web archive abyss? Or could it yet prove to be one of the Big Lottery Fund’s great successes? Earlier in 2011, when KnowHow’s lottery funding ran out, it had not managed to implement a sustainable business plan. However, its successes made it hard to ignore: 865,000 visits; two and half million page views; 20,000 registered users; a suite of genuinely unique services designed to improve self-directed learning and organisational development in the sector. These achievements placed it firmly in the top tier of the sector’s capacity-building websites. In a move endorsed by the Big Lottery Fund, NCVO agreed take on KnowHow NonProfit, the aim being to consolidate staff, technology, and online services to create a joint, ‘better than both’ online solution for voluntary sector capacity-building. This merger marks a major shift in the positioning of both KnowHow NonProfit and NCVO in terms of their web provision to the sector. For KnowHow NonProfit, it’s the opportunity to deliver on its early promise and prove that its commitment to social learning, collaborative technology and low-cost e-learning can cut it on a grand scale. For NCVO it represents a shift away from a predominantly expert-driven, ‘broadcast’ model of web publishing to a more facilitative approach that will see it finding new ways to foster debate, dialogue and knowledge exchange within the sector. The work to build the ‘better than both’ solution has begun. The aspiration is to build an online space for advice, learning and support that is owned by the sector, but ‘powered’ and facilitated by NCVO. It will transcend but include what’s already been created in the NCVO and KnowHow NonProfit websites. And, by uniting their combined expertise and reach, it will become the ‘go to’ place for people wanting to do their jobs better or help their organisations achieve more. link up with what’s already out there on the web, as well as one or two initiatives that we know are being commissioned from other parts of the sector. Once we have our ‘straw man’, or several ‘straw men’, we’ll be asking the sector to feed in their thoughts on our progress so far. This is scheduled for next February and we’d really appreciate your input. In the meantime, it’s business as usual for NCVO. 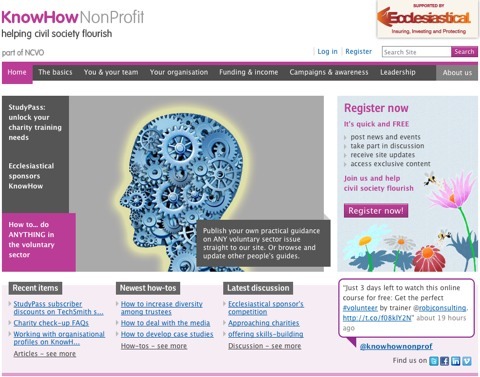 As for KnowHow NonProfit, don’t expect to see a cyber gravestone just yet.